Please understand that any information sent to Finnegan on an unsolicited basis may not be treated as confidential. 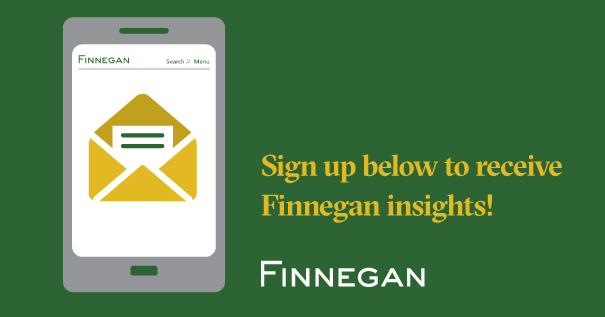 Nor will sending an e-mail to Finnegan generally be considered as a request to take action with respect to the information. Any request to take action, such as filing a patent application with a patent office, can only be made by an existing client of the firm contacting an attorney or other authorized representative of the firm who has responsibility for the client’s activities. For convenience, we have provided links to websites maintained by certain organizations and agencies. Finnegan does not necessarily endorse, sponsor, or approve any third-party content that may be accessible in this manner and is not responsible for its content. Finnegan Europe LLP operates as a limited liability partnership registered in England and Wales with registered number OC382336. Its registered office is located at 16 Old Bailey, London, EC4M 7EG.